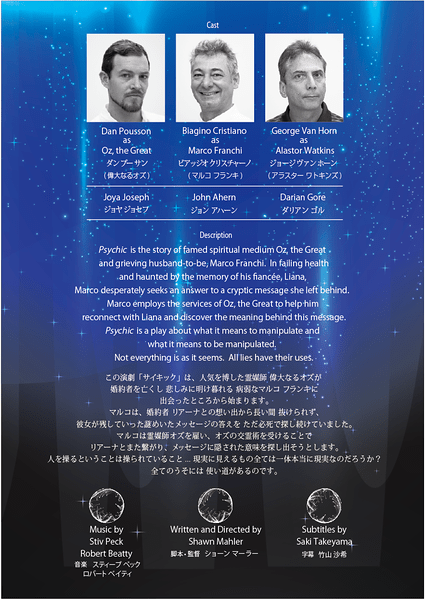 Psychic is the story of famed spiritual medium Oz, the Great and grieving husband-to-be, Marco. In failing health and haunted by the memory of his fiancée Marco desperately seeks an answer to a cryptic message she left behind. Marco employs the services of Oz, the Great to help him reconnect with Liana and discover the meaning behind this message. Psychic is a play about what it means to manipulate and what it means to be manipulated. Not everything is as it seems. All lies have their uses. One of our goals as an organization is fostering a love of the English language through consuming and producing English language theater. 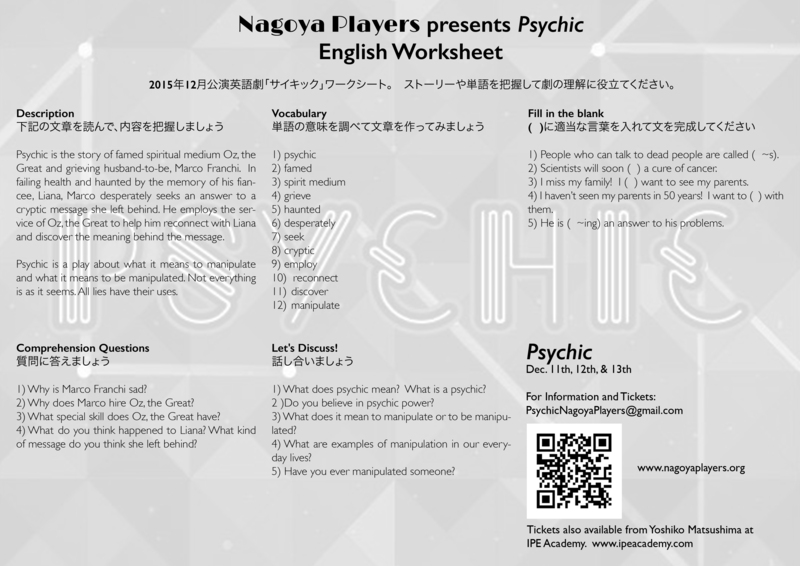 Towards that goal we have produced, with an assist from IPE Academy, a worksheet which can be used at your eikaiwa or other language school. Feel free to use this as a part of your course curriculum or English discussion classes. If you work in education and are interested in working with the Players to foster a love of English language theater in your own students, get in touch. We would love to hear from you. Big Thanks to Geoffrey Griggs who stopped by to photograph the cast at work. We were very blessed to have two extremely talented photographers visit us and capture the show. A huge thanks a Nagoya institution, Andy Boone. And a huge thanks to an amazing artist, Geoffrey Griggs. Thank you so gentlemen for recording this show in photo. Aesop’s Fables Premieres This Weekend! Copyright © 2019 Nagoya Players. All Rights Reserved.